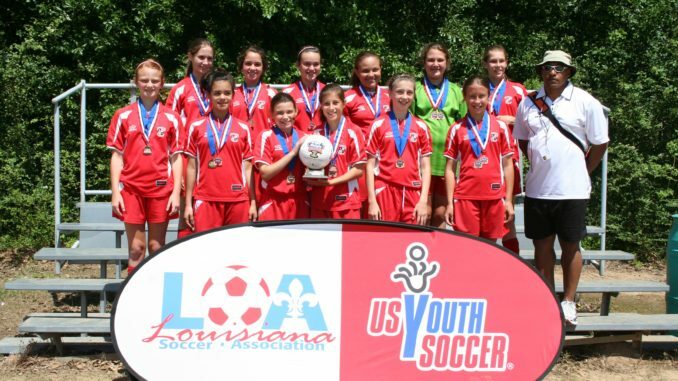 The Lafreniere ’96 Sting U-12 girls soccer team won the Division I Allstate Sugarbowl State Championship in Lafayette on May 3 and 4. In their quest for the championship they defeated the NELSA Bombers 2-1 in overtime in the quarterfinals, Covington Spartans 3-1 in the semi-finals, and the Lafayette LA Galaxy 3-1 in the championship game. 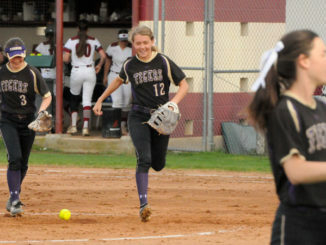 Three St. Charles Parish girls competed: Grayson Touchard, 7th grader at J.B. Martin Middle School, Kimberly Porche, 6th grader at Lakewood Elementary School, and Jennifer McClendon, 6th grader at Ethel Schoeffner Elementary School. Pictured are: Back Row (l to r): Rebecca Dumestre, Ashley Berluchaux, Grayson Touchard, Hannah Randolph, Taylor LeBlanc, Jennifer McClendon. Front Row (l to r): Laura Griffith, Jennifer Portillo, Katie Brousse, Maddie Denenea, Caroline Wade, Kimberly Porche, Coach Colin Rocke.